A professional kitchen designer ensures that you get the best result from your remodeling project. These days, you can find a ton of beautiful kitchen remodeling projects on websites like Pinterest. Many ambitious homeowners see these tantalizing photos and think, “I should do that!” While using the web is great for inspiration, it’s important to keep in mind that a professional kitchen designer is one thing you can’t afford to do without. According to the National Kitchen and Bath Association, a professional designer usually only represents about four percent of your total project’s budgets. Now consider that a professional designer’s expertise saves you a ton of time and money, in addition to ensuring that your project has a more valuable, professional result. That’s a steal. Furthermore, working with a professional kitchen designer takes huge responsibility off of you. You won’t have to talk to vendors or contractors, accept deliveries, schedule tradespeople, or any number of other management issues. A professional designer has working relationships with manufacturers, suppliers and tradespeople that are not available to your average homeowner. They can make sure that the products you are getting and the materials you are using are the best for your investment. One of the most common things that clients say to their designer is, “I didn’t know that was something to consider.” A certified kitchen and bath designer helps translate your vision, often in ways that you hadn’t yet fully realized. This will help you maximize the functional and aesthetic use of your space, desired resources and what you achieve with your budget. As one of the most important investments you can make in your home, it’s important to undergo careful planning before you begin your remodeling project. 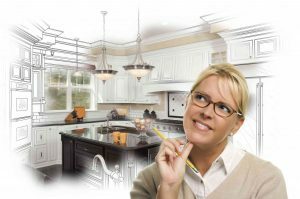 A certified kitchen designer has unique building knowledge and is tested to rigorous and relevant standards. Hiring a professional kitchen designer will ensure that you get long-lasting value from your remodeled kitchen, all while avoiding any expensive mistakes or misgivings. Ready to get started on your next kitchen remodeling project? Kenwood Kitchens can help. Since opening its doors in 1974, Kenwood Kitchens has made a name for itself throughout Maryland as a complete kitchen and bathroom remodeling firm. With showrooms located in Lutherville, Abingdon, Columbia or Annapolis, Maryland, Kenwood Kitchens is the place for all of your kitchen and bathroom needs. We’re also featuring a special Wood-Mode savings event until December 30th. Don’t hesitate to give us a call at (800) 211-8394. This entry was posted on Friday, October 28th, 2016 at 3:20 pm. Both comments and pings are currently closed.